Few Brighton restaurants can boast of such a prime seafront location as The Brasserie, the perfect spot for afternoon tea in Brighton and fine dining. The Coast View Suite provides a sea view backdrop for weddings and private events of all types. The famous Bandstand is directly opposite the hotel and can be booked for weddings. Guests arriving on business will also be pleased to find a number of meeting rooms, making it the obvious choice for business in Brighton. Rooms and some areas were nicely decorated, tho major renovations were happening which we were not informed about. On checking out we found our vehicles blocked in the car park by trade vans. The removal of these took over 30mins which made us late for work. Was bad and wouldn’t go back to this Mercure hotel ever. Was a disappointing stay. We booked the night for my birthday and was in a room next to the car pack and loading bay was just so noisy and had to go get my own towels for the room and staff wasn’t helpful at all. I’ve stayed at a few Mercure hotels cause they are our favourite ones but this one in Brighton was such a disappointment and especially On my birthday. Lift operation to Mews rooms was absolutely useless - notice posted made no sense at all. Bar was unattended when I tried to order a drink around 6 pm - I had to go and seek someone to serve!! tried to put us in a disabled room that smelt pretty bad then when we refused to stay in it we were moved to a tiny room, the lift to the 2nd floor did not work and clearly not worked for a while, we witnessed disabled residents struggling down the stairs. Amenities in the rooms we booked were very poor. The control on the radiator was stuck on off. There wasn’t a phone in the room my 90 year old mother was staying in meaning she couldn’t be left on her own. We complained to reception but they were not interested. There wasn’t a wardrobe in the room, just a hanging rail, no fridge or safe. These are standard in a lot of less expensive hotels. At the time of booking our two night break at Mercure Brighton, we were looking forward to our stay, when we got there we were very disappointed because we were not warned about the fact that major renovation works were being carried out trough out the hotel, so we did not enjoy our stay. The hotel description on your web site is also very misleading, we upgraded to a superior room and for the money we paid it was very poor, yes it had been redecorated but it did not have everything it was suppose to have. So Accor Hotels please be honest with your customers if you want them to use you again. This hotel is in a great location, on the seafront close to the i360 and within easy walking distance of The Lanes, The Pier, The Pavilion the town centre. The lobby is impressive and the staff friendly and helpful. However there is clearly a lot of building work going on and the whole place has a slightly run down and unfinished air to it. This would be fine if we had been informed in advance but we were not and there was no sign of any compensation or explanation. The breakfast was disappointing, again this was explained by the building works but, again, we were not warned. I am really sorry for the disruption that you experienced during the recent hotel refurbishment. 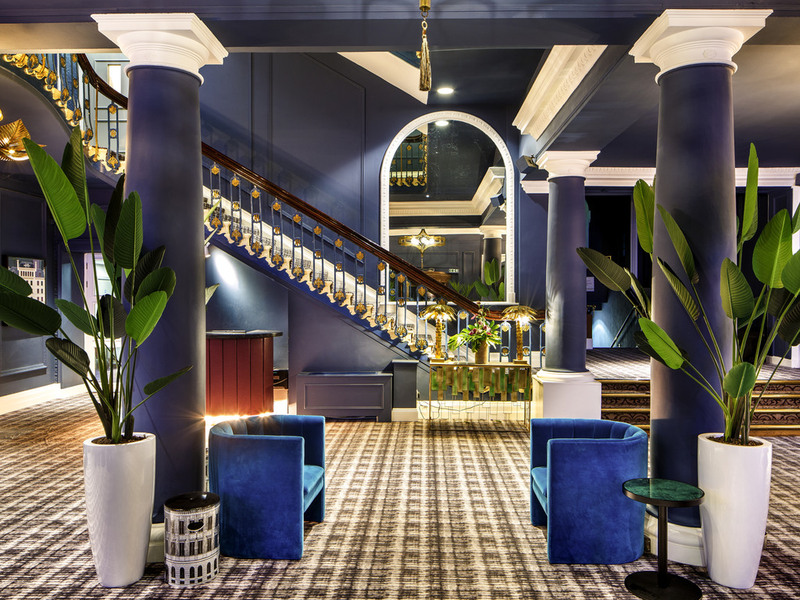 We are pleased to say that the works are now almost complete and we are delighted with how the hotel is now looking and we are looking forward to the full relaunch at the end of the month. In a newly refurbished room, however TV didn’t work. Only 2 towels left likewise very few tea/coffee/milk. Pity radiator wasn’t stripped then repainted likewise the window needs totally replacing as rotten. The bed was extremely comfortable. The reception area is far too small and cramped. Looks not very professional. Breakfast was good and constantly being replenished. Perhaps continental could be expanded as no meats/cheeses present. Staff were very accommodating and pleasant. We were there for the marathon so the Mercure was the ideal place to stay. It looks like the hotel will be fantastic when it's finished but we were aware of building work going on but the staff were great at making it as smooth as possible. I was annoyed to find that you had a car park. I phoned about a month ago and was told you didn't have a car park, so I came on the train which cost me more. Also, when booking you ask for any additional comments on the Accor booking form but no one responds to this. As a runner I needed to know if you served porridge at breakfast but no one knew when I called to check. (It turns out that you did so thank you). Basically then, a bit more communication would get a much better review from me. The room was spacious and clean, the staff were friendly and very helpful. The hotel was having some work do e but this did not affect our stay. Have stayed in a Mercure hotel before which was excellent.brighton Mercure was very underwhelming,very expensiveand very tatty. Acceptable but a little pricey. Good night sleep in clean and comfortable surroundings. On the downside the toilet flush was defective requiring multiple flushes and the lifts were dated and left me momentarily stranded between floors and then wouldn't proceed to the desired floor. A bit disconcerting! I was worried about my stay after reading the reviews but i'm all for trying and experiencing for myself. I was lead to believe the renovations would have been completed by the end of March, this wasnt the case. The entrance was often blocked by builders (also found peieces of glass on the stairs - not good for anyone particularly with a 3 year old), the entrance was also very dusťy - luckily the check in staff were friendly and welcoming. The lift worked once during our stay, this resulted in me having to carry suitcases up and down (although the staff offered help), however it meant i had to wake my son 3 times to get up to our room then had the upset that follows and the difficult time putting him back to sleep. This ruined 2 of our 3 evenings in Brighton. I asked to speak to a manager, to complain, i was told they are all in a meeting, i asked for that to be interupted. Ewa (manager) sympathised and offered her apologies, Ewa promised to either call me or see me in person after she escalated my complaint. I was then offered 2000 loyalty points by the reception team to compensate (valued at around £25). Ewa did not make contact with me. Tempory restaurant in place (couples as the bar) and wasnt a good environment to eat or drink, although the staff were excellent. Overall average experience, disappointed with the hotels inability to resolve my complaint. When we arrived we went straight to check in, which was done by a friendly, although very confusing man. He had a very thick accent and it made it very hard to understand what he was trying to tell us, which made me feel uncomfortable about the papers I had to sign. We were also pointed in the direction of our room, being told to go left, when the room was actually to the right, so we made our way back to the reception and were given a much better description by a different man. Walking through the narrow corridors, the floorboards were creaky the whole way, which I felt was like a horror movie, and my girlfriend compared it to being on a boat. The room was much smaller than we expected, we knew we were getting one of the regular rooms, but my bedroom at home is bigger. The bathroom seemed nice on a first glance, before we realised the sink was cracked and had some dirt in it that looked like bogeys. Behind the door the paint work (we could tell it was fairly recent or the room hadn’t been stayed in much as it still stank of paint) was very slap dash, and I can’t remember if it had a big chip of paint missing or if it had a splash of a different colour. My girlfriend found the issue of not having anything close to enough sanitation bags, which were not topped up the following morning. The shower was far too small, being a very tall man, I’m used to not being able to stand up in showers, but it’s not usually because the ceiling gets in the way. We also had the issue of the toilet flushing, it took 15+ minutes for the cistern to refill for a second flush which made the morning routine for us very uncomfortable. Back to the room, I was fully expecting to have a refrigerator, I had brought a bottle of Prosecco for us to celebrate, and we didn’t have it in the end because we’d have had to have it at room temperature. A selection of alcohol and soft drinks in the room would’ve been nice, and we definitely would’ve spent more money with you if that was an option. At first, it seemed like we may have had a room with a view, instead it turned out to be some kind of odd communal patio, meaning we had to keep our curtains closed for almost the whole stay, leaving the room very dark and dingy, as there was no proper light, just the two bedside, and the two by the mirror opposite to the bed. The bed itself was ridiculously creaky, which meant we woke up multiple times in the night from simply rolling over. We also had the issue of finding plug sockets to charge our phones, all of them on the other side of the room so we couldn’t have our phones next to us for our alarms in the mornings. The second night we noticed that our bed sheets were ripped in one of the top corners. Walking through the corridors one afternoon, we crossed paths with one of the members of staff, he said good afternoon, and seemed polite as he was walking towards us, but we reached a door frame, and while I expected him to allow us to go through first, he came through at the same time as me, pushing me aside, it was clearly unintentional, and he must’ve been in a rush, but it was just a total lack of common courtesy. The hotel seemed to be quiet, we didn’t see anybody else past the reception or bar other than hotel staff and the builders, (which reminds me, there was no mention of the hotel being under maintenance when I paid for it) which would make me think that we could’ve been shown a bit more attention, such as being walked to the room the first time, maybe even had our bags taken for us, or at least offered some kind of trolley. The only reason I’ve put it as 2/10 instead of 1/10 is that I found the reception to be charming, and although there was no clear theme, I liked the arrangement of the art. We really enjoyed our stay in Brighton, unfortunately your hotel was not a part of the reason. We chose your hotel as it seemed homely, and found that your website is very much a misrepresentation of how it really is. If we return to the town we will be sure to find a different place, and I will actively be telling people how disappointed we were, and recommending finding somewhere different to stay. Our room was 171 if you felt the need to check the problems mentioned (cracked sink etc). It was advertised as a luxury break but was definitely not luxurious. The lift failed to operate, no member of staff asked if I was okay to carry my luggage up the staircase to the mews room. Room was nice, bed very comfortable bathroom was lovely, dinner in restaurant was tasty if a tad overpriced. The car parking is massively overpriced.